Everyone needs a coleslaw recipe. But not one with mayonnaise - one that's light and tangy and a perfect accompaniment for any BBQ. I credit my godmother, Maggie Beadman, for the inspiration for this version (Jane). 1. 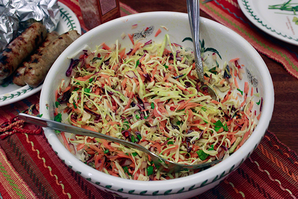 Make the slaw: combine all ingredients in large bowl. 2. Make the dressing: combine all ingredients and shake well. 3. Pour dressing over slaw. If you can let the ingredients sit for around 10 - 15 minutes before serving so that all the flavors can melt together. 4. Enjoy with your BBQ feast! Henry is a fan of mixing his coleslaw with chipotle rice and whatever meat we've cooked! 5. Left overs will keep in the refrigerator to enjoy another day - but it does tend to pickle a bit. Still good though!